Most of us would say that we don’t have enough storage in our homes. This is why getting organised and decluttering is so hard. One of the hardest working rooms in your home can be the bedrooms, with clothes and personal items to store it can get crowded and feel less than relaxing very quickly. I love it when I truly find a solution to help with this struggle – and that is using storage beds. I’d love to share this with you today, in the hope that you may want to join me in making all beds work hard for their spot in the room! Bedrooms are fundamentally where we sleep, where we wake up to face the day – and where we go to get peace and quiet. As such we want them to reflect as much calm and serenity as possible. The other side to a bedroom though is the amount of stuff it needs to house – from clothing and personal items, to jewellery, accessories and all manner of other items (books, magazines etc…). We can’t really get away with how much we need to store (even with a good declutter it still amounts to quite a bit), but this can really affect trying to feel relaxed and calm in the space as well. The solution, as with most organising, is to find the right storage for the space we have. Being able to store away everything out of sight means that the room can be really functional, but also relax us when we want to rest. Great storage is a must for a functional and practical home. As such it makes perfect sense to think about making what you already need work that bit harder for you – and what better than making things as multi functional as possible. With that in mind, I wanted to show you what I consider to be the best bedroom storage idea that I’ve come across – as it makes the best use of the largest possible wasted space you have – and that’s a storage (or ottoman) bed. What is a storage bed? 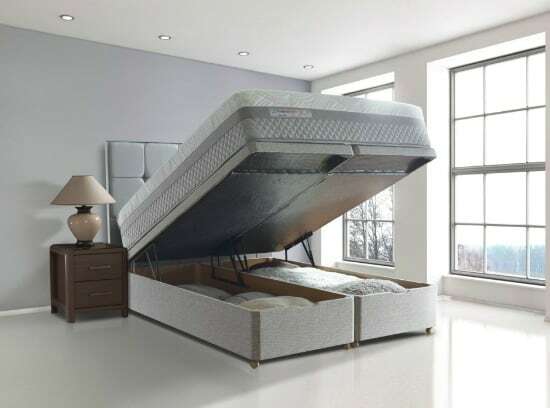 A storage bed is simply a bed that has built in storage underneath the mattress area. Simple! It makes sense really to utilise this space as much as possible – after all, your bed is the biggest piece of furniture you are likely to have in your bedroom – taking up the most amount of floor space – and just using that amount of space for sleeping can seem crazy (especially if you have a small bedroom to start with). Now – you may say that simply adding in storage boxes under the bed works just fine – and I used to do this under my own bed for years, but it really is far from ideal. I got so sick of having to be a contortionist and do that funny commando crawl to get to one last lone box from under the bed, only to find when I managed to get out (crawling backwards is HARD! ), a layer of dust that had been quite happy to be forgotten about completely over the years had managed to migrate all over the boxes and often onto whatever was in the box as well…. yuck! Let’s face it – under the bed is definitely one of those areas that doesn’t get a weekly clean as it tends to be an out of sight out of mind mentality – and who can pull a bed out easily?! (in my house under the beds are lucky to see a hoover seasonally….. I confess!). It’s simply too hard to move such a large piece of furniture, and when things are hard we simply don’t do them as often as we probably should. When we needed to replace our bed (note to self, jumping on a bed that has pine slats under the mattress probably isn’t going to increase the life span of the bed!!!! – even if it is fun!) I started on a mission to find something that looked good, had space for storing things under it, but stopped the frustrating things that I was getting simply tired of. And that’s when I found the amazing solution of a storage bed – sometimes known as an ottoman bed as well. What are the benefits of a storage bed? Great for maximising your storage – You can buy under bed boxes that fit under most beds – but when I first changed beds to a storage bed, the stuff I had under my old bed (which filled it completely) only filled about a quarter of the new space! Guest rooms can have hidden storage – I like to store bedding, out of season clothes etc. in our guest bedroom bed storage. Its not needed on a regular basis, but is readily available when we do need it – and guests don’t have to see everything. In fact, they don’t even know that the bed has storage in it as it is not obvious at all. Storage Beds work great in Master bedrooms – Master bedrooms work well as some storage beds can be quite high up which gives the bed more prominence in the room, and also then gives more storage (again great for out of season clothes or large collections of handbags and shoes!). They can create hidden storage from whoever you need! -They are a great hidden place when you have small children as you can hide presents etc… from little eyes. (try and not let them see that the bed has storage in it and it will be a winning hiding place for years to come!) It’s also a great place to store things when you’re on holiday as they are less likely to be found if you get broken into. They avoid too much furniture in a room -They stop you having to have a large cupboard or chest of drawers in the room – thus freeing space and helping you to become more visually clutter free. They take away the need for crawling to find things -They are MUCH easier to get hold of things that you have stored there. A lot of beds have a mechanism that lifts the mattress with minimal effort from you – and you can choose whether you want a bed that’s hinged from the side or the headboard. They stop dust reaching your stuff much more effectively than boxes under a normal bed. Have I sold you on the idea yet!? (I really honestly believe that swapping to a storage bed can transform your bedroom like no other item of furniture could). Here’s an example of my own bedrooms storage – and just how spacious it can be – there’s so much stored under our bed, and as you can see, there’s much more space that we can use as well. If we had to store all this elsewhere in our bedroom, we would probably need another wardrobe sized unit that would take up a lot of space and make the room feel cluttered. It’s also very open so you can grab what you need more easily – which is a huge bonus to the alternative of boxes under the bed. 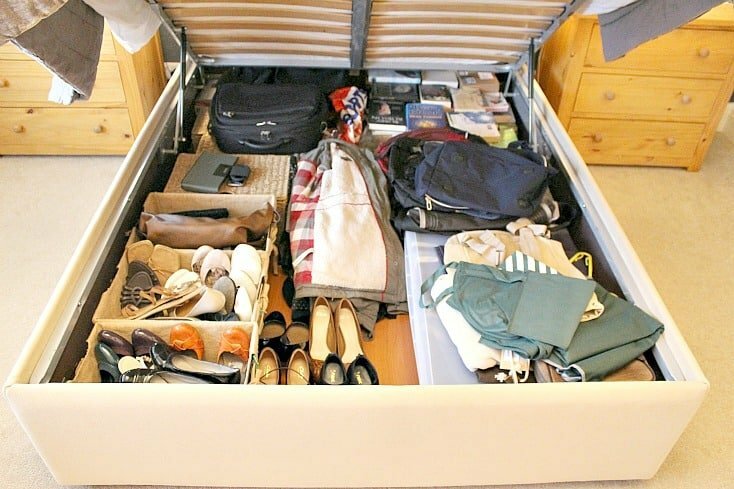 If you are tempted – here are some key things to look for when you are buying a storage bed – and worth considering whether you need them or whether you can get a cheaper bed that does what you want instead. How much storage do you want? Look at the height of the base as some are a lot shallower than others, and if you want to store suitcases etc… you want to ensure they will fit. Some beds have a base and can be on feet – which I personally prefer – but others have a simple layer of fabric that goes on the floor. The former is more expensive, but gives a better finish. You can get leather finish beds with headboards, which are more common in the cheaper price brackets – but you can also get fabric finished beds which you can match to your decor. Because the bed lifts to allow access to storage, make sure you have the height space in the room – i.e. there are no lights that will get hit. Also think about how you want to open the bed – would you be better having one that opened down the side, or at the foot of the bed? Make sure that it will work for you and your room. Who would benefit from a Storage Bed? Well, frankly – most bedrooms would benefit from a storage bed. It just makes sense really! They work well in smaller spaces to maximise bedroom storage – especially flats, rentals and smaller sized bedrooms that have room for a bed but not much other furniture. Basically – they can be used anywhere as they maximise the space and minimise the need for other furniture. This is from Furl– and I have chosen this as it’s my own bed – so I can personally vouch for its ease of use, deep storage size, and choice of fabrics. I simply LOVE it! There are so many different options that you can really make the bed exactly what you want and need. Perfect! This is a great bed** that we bought for our guest bedroom from Amazon. It’s a cost effective option, and we chose this as we didn’t need to store as much in this room (it’s less deep than the one in our master bedroom) – but it’s a relatively small room so made sense to create extra storage too. I particularly like the leather finish and the headboard looks really great in both traditional and contemporary designed rooms. This is a new addition to the beds available at IKEA – and the Malm range is a firm favourite for its style (fits well into most schemes) and range of available colours (black-brown and white). From a well known brand, this is a new range for Sealy – and looks really comfortable with loads of storage, of course! (They sell through various shops and there is a store finder on their site for ease). If you’re struggling with space in your bedroom, and are looking to tackle your bedroom storage in the near future, then why not consider an ottoman / storage bed?. They can really help in creating a more streamlined and organised bedroom. I honestly wouldn’t choose another type of bed now – it makes use of wasted space in a way thats practical, accessible, and easy to use. Perfect! I would like to thank Sealy Beds for the collaboration with me on this post. To find out more about their Ottoman Beds please click HERE. As always, all thoughts, opinions and ideas are my own and are in no way altered by this collaboration. To find out more please see my disclosure policy. I like your tip about measuring the size of the storage you would need. That would make sense considering you don’t want to buy something that is too big or too small for you. I’ll have to consider your tips so that I can organize my house better. Do you have any experience of the Malm ottoman from Ikea re: quality, ease of assembly, etc? I have just paid for but not received an ottoman bed for myself and can’t wait to take delivery of it, but I need one for my teen son too in a single bed size. I don’t want to pay too much for it, but choices seem limited. It’s a shame that Ikea don’t sell their MALM beds in single size! I have this bed, it’s great for hiding Christmas presents from the kids, also valuables……it’s probably the last place a burglar will look. Thanks for your comment Angie – I couldn’t live without mine now – it’s so useful!